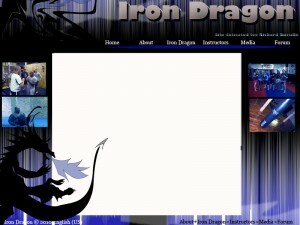 For this post, I will be reviewing potential website layouts. 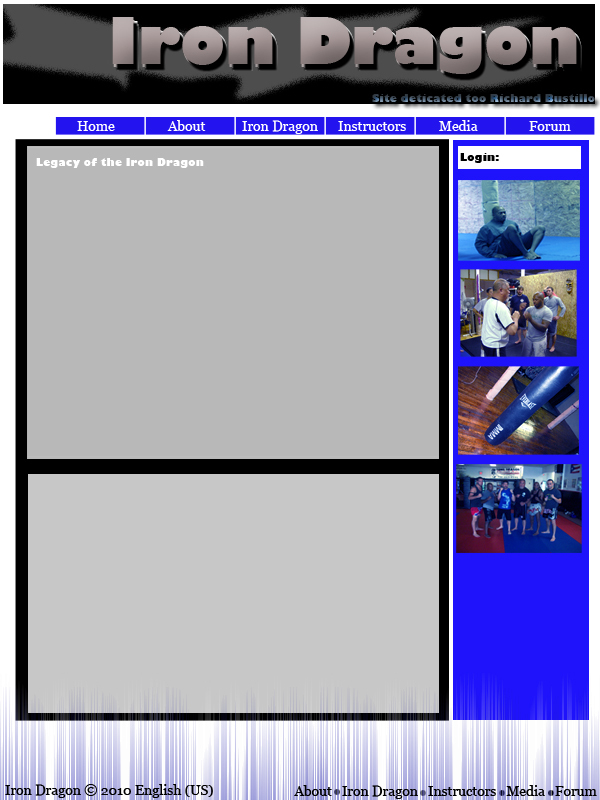 First we have Legacy of the Iron Dragon as designed by the blogger at Now is the Moment of Power. The website is dedicated to Mixed Martial Arts enthusiasts and connecting these individuals together. The underlining theme is to also serve as a tribute to Martial Arts legend Richard Bustillo. So this is a tribute site that also serves a functional purpose to the user, which is a great concept (plus the association with Richard Bustillo adds more authenticity to it). Most of my critique will focus one Version 1, as Version 2 (based on the order they were on the blog) appears to be an early draft with some of the elements that would go into the first version on the post. Right off the bat, I noticed the font for Iron Dragon. Nice bold choice of blending modes that capture the word “Iron” to me. I like the color choices. At first, the word “Dragon” might convey green (of a dragon) or red/orange in terms of fire, but given the MMA theme and qualities the blogger mentioned, it works perfectly. This is also captured really well in the background. Another dominant feature for me is the dragon on the left hand side. Not sure how it was created (pen tool? ), but it’s very detailed and a great graphic. I might consider adding a light drop shadow or outer glow (or experiment with some blending) on the dragon to have it pop more. I am not so crazy about the fire graphic coming out of the dragon, though. In fact, I know this blogger can create a really visual “fire” graphic (as seen here), so I don’t really need to give any pointers there. I like the images on the sides, but I might consider using a transparent gradient around the square to help them blend in a little more. Really cool smoke graphic used towards the bottom right. Maybe that is something that can be used on the other pages as well. Lastly, I would maybe use a different color or blending mode for Richard Bustillo’s name to stand out more (also watch the spelling on “to”). If others are contributing to the site, I would also include the “Login” option from Version 2 to the first one. Overall, I believe some really great graphics were created (especially the background), so I think a very good groundwork was laid out for the rest of the site pages. I also think the rest of the site should flow pretty naturally, given the blogger’s passion for MMA. Great job. 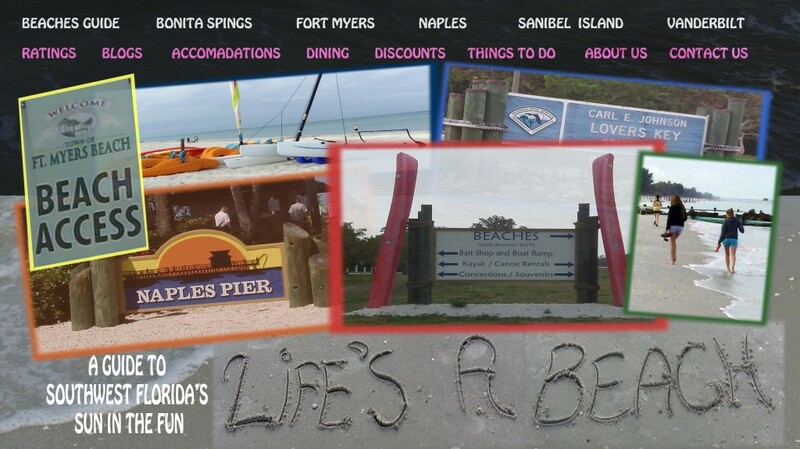 The next website is from the blogger at Seeking the truth with the design for Life’s A Beach, a site which serves as a travel guide to the beaches of Southwest Florida. First off, I appreciate that the blogger went with two different, contrasting looks and used what photos he had effectively. To be honest, they each have qualities I like separately, but I’ll start with the first one. I think the background on the first edition is a really great shot. The overall imagery is very good, but the text is kind of distracting. It is diverse in color and also font style. 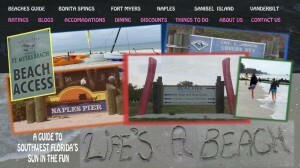 The Life’s A Beach font is relaxed in tone, while the destinations on the right and menu options on the bottom seem a bit more rigid. I would experiment with that font to keep a consistent feel. I have to agree with the blogger, the second edition of the draft is more aesthetically pleasing. 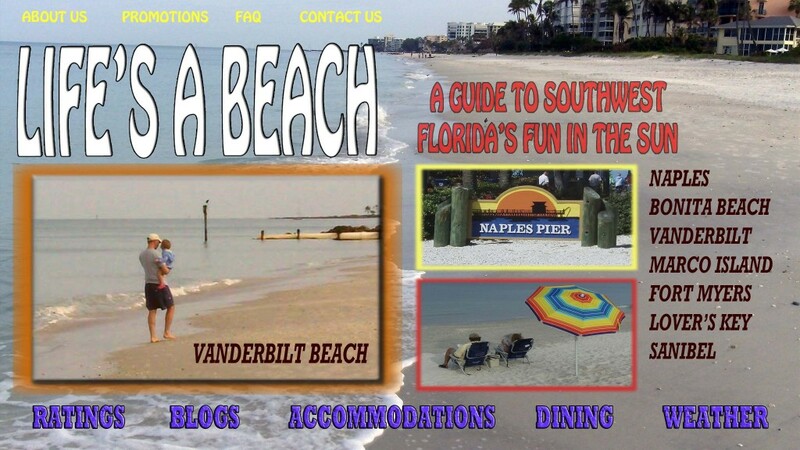 Given the fact that the audience are beach-goers and vacationers, I would say this is the way to go. First off, writing Life’s A Beach in the sand on the bottom is a fantastic touch. It’s simple but extremely effective. I might consider centering it and scaling it larger for greater emphasis. I love the pictures of the beaches spread out as they are. To me the site has an overall, postcard within a postcard look to it and I think this is absolutely perfect for the audience. If you have the pictures, I might consider having each one be clickable with the title of the destination, this way maybe you can eliminate the destinations on the top of the page and have them somewhere in the picture. By doing this, you could free up some room and make the Ratings – Contact Us text enlarged, but just a suggestion. As I said earlier, I think the pictures are very good, but if the weather doesn’t cooperate, Lynda does provide some great examples of how to lighten up and fix the brightness of a photo, which was a help to me. Overall, the concept of the website is very good and lends itself to being colorful and visual which the designer has created here. Like the first website, I think this is also some good groundwork for the rest of the site and should reflect in the forthcoming pages. Nice work.